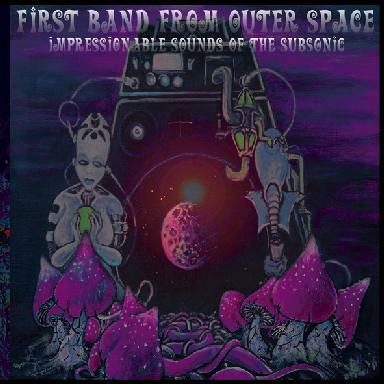 First Band From Outer Space - "Impressionable Sounds of the Subsonic"
The great Swedish space rock band, First Band from Outer Space, are back with their new CD. It starts with Novaja Zemelja and sounds like babies being born in space before taking off. The track is an instrumental jam and features a lot of the new member's sounds, with more spacey synths and flutes, etc. The band started out as a three piece and is now expanded into 6! Utan att Veta is next (8 minutes) and takes the heaviness of the space to a higher level and this one is sung in Swedish as well. I love the real free and jamming vibe of the music and the sound production is excellent and clear and spacey at the same time. The tracks on the CD all segue into each other and there is a space ship take off countdown that starts the melodic but hard driving Mean Spacemachine for the next ride. Here is the first appearance of guest or new vocalist Astrorille with a heavily distorted vocal. A very cool space rock track that floats into the 10 minute title track that begins with some beautiful flute playing and acoustic guitar but builds into a monster! To Be Seen As The Underdog continues and bring the music down and tells a potent story by Astrorille, backed by acoustic guitars and tablas and space sounds. Gröna Händer is next and is the longest track at 13 minutes. It begins with some heavy bass lines as the jam kicks in and starts the next space journey that begins as a sort of jam out of the last acoustic track. Nice. They get into a very cool spacey upbeat tabla, chanting spaced out thing before taking off once again. Todo Pasara reminds me of Jethro Tull in many ways and is again sung in Swedish but it gets totally psyched out!!!!!!! Mission Completed ends this amazing CD. Wow... a must have for all space rock fans.